Each year, the Cobb Chamber of Commerce sponsors a Give Our Schools a Hand (GOSH) breakfast and pep rally to show appreciation for teachers in the community. This year marked the 30th annual GOSH event, and there were more than 130 Teachers of the Year from Cobb County, Marietta City and Post-Secondary Education Systems recognized and celebrated. This salute to education is one of the largest in the nation. 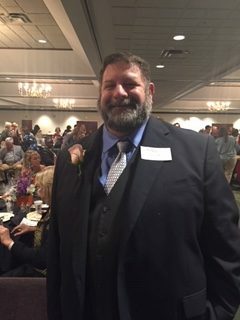 On Tuesday, October 23, 2018, Dr. Joe Guagliardo represented Life University as the Teacher of the Year at the GOSH event. He received recognition as one of Cobb County’s most deserving teachers who focuses on education, teaching and learning to the many students whose lives he influences every day. He was accompanied by his sister Mrs. Mary Beth Peters who attended the celebration to share in this exciting moment with him. Please help me in congratulating Dr. Joe Guagliardo on this amazing honor of being recognized as Teacher of the Year by the Cobb Chamber of Commerce!